“I can’t decide; I saw it well enough, but I’m not sure which one it was!” This is a common identification challenge for various pairs of common birds. It is easy to narrow it down to two species, but taking that last step becomes much more difficult. In eastern North America, I think that one of the best examples of this conundrum is Downy vs. Hairy Woodpecker. These are both rather common birds that are seen often, but it can be hard to make that final decision: Was the bill long enough? How big was it? This is one of those cases where a simple psychological rule can be applied: If I’m questioning which one it is, it is probably a Downy. When an actual Hairy shows up, there is usually not much question as to its identity. The bill seems clearly longer, the bird seems bulkier, has more obvious “shoulders”, and everything adds up to Hairy Woodpecker. When you are confronted with a Hairy Woodpecker, you know what it is. When you are confronted with a Downy Woodpecker, it is easy to question yourself and try to trick your mind into believing the bill seemed a little long or it wasn’t small enough. Deliberation should encourage strong consideration of the default choice. In this case, Downy. Another pair that often causes confusion is Greater vs. Lesser Yellowlegs. 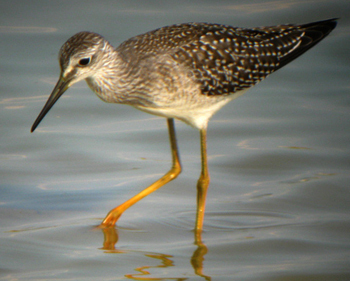 In this case, I think that the default should be Lesser Yellowlegs. Again, when confronted with a Greater Yellowlegs, the larger size and longer, upturned bill make it obvious. If you are asking yourself which one it is, it is probably a Lesser. A yellowlegs, but which one? Nothing about the bill “jumps out” at me, so I’ll call it a Lesser. I can certainly think of a few pairs of species where I don’t recommend this approach: Cooper’s vs. Sharp-shinned Hawk and Short-billed vs. Long-billed Dowitcher come to mind. With these pairs, there is no default species (except expectations due to distribution or migration patterns). Each time these species are encountered, they must be carefully considered, and I don’t expect anything to be exceptionally obvious on one or the other. I’d be interested to hear of other examples where this psychological trick (“If it doesn’t jump out at you, it must be the default species of the pair”) can be used. Any suggestions?